Hrithik Roshan is celebrating his 45th birthday today and Bollywood celebs are pouring in their wishes for the actor. 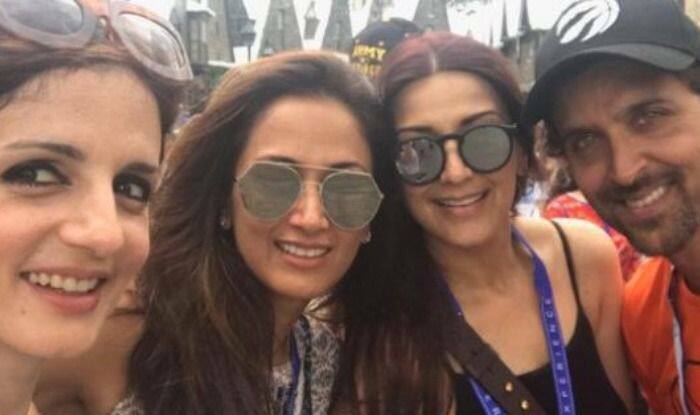 Earlier today, his ex-wife Sussanne Khan shared a few pictures on Instagram and wished him. Now Sonali Bendre has shared an unseen picture with the Krishh actor and wished him. Happiest Birthday to you, Duggu! Love, health and happiness always! Earlier, Sussanne wished Hrithik and shared a couple of pictures with their kids on Instagram. She captioned it,“Happiest happy birthday to my BFF from and through this world…and onto other realms.. the force will always be with you #shineonunlimited#thisman #bestBBF #10january2018#bestdadintheworld #soulmate”. A few days back, the Jodha Akbar actor took to his Instagram to reveal about his father Rakesh Roshan’s battle with cancer. He shared a picture with his father before hitting the gym where the father-son duo can be seen giving a macho pose. After a while, Hrithik’s ex-wife Sussanne showered her love for Rakesh and wrote, “He is stronger than any superhero, all will go smoothly”. Earlier, Irrfan Khan and Sonali Bendre were diagnosed with cancer. Speculations are also rife that Rishi Kapoor, who is undergoing medical treatment in New York is also battling with cancer. Hrithik and Sussanne tied the knot in 2000 but due to differences, the couple parted ways in 2014. They have two kids Hridhaan and Hrehaan Roshan. Even though Hrithik and Sussane are not together anymore, they still share a great bond and are seen going out on dinner dates with their kids. On a professional front, Hrithik is gearing up for the release of his upcoming film Super 30. The movie is based on the life of mathematician Anand Kumar. It was directed by Vikas Bahl. However, after #MeeToo allegations against him, he was asked to step down. It is all set to hit the screens on January 25 and will fight the box office battle with Kangana Ranaut starrer Manikarnika: The Queen of Jhansi.